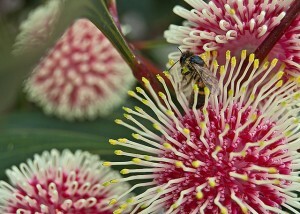 Guide for selecting the best Australian suited flowers and plants to benefit the bees, pollinators and your garden. Bees are hard working and often under-appreciated just like you and me right!. So we have decided to make life a little easier for our fuzzy friends by planting in our gardens a few of their favourite flowers and hopefully, you will too. Without the Aussie native bees or introduced honeybees, we wouldn’t have a flower industry, let alone life as we know it. 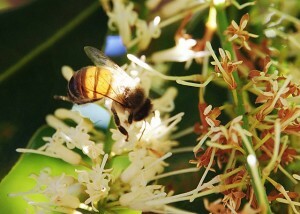 Australia is one of the top ten honey producing countries in the world; Honeybees are essential to both the agricultural and horticultural segments of the flower industry thanks to their pollination services, not to mention the raw flavoured and unflavored honey, royal jelly and pollen. Urban environments also benefit from their activities. Planting bee forages for honeybee nutrition can offer significant benefits to the industry and society as a whole. Although Australia’s existing resource of flora is plentiful and well-suited to the needs of the honeybee industry, its future is precarious. Did you know that Australia has over 1,500 species of native bee which are non-aggressive, and some of them do not even sting! And there are over 25,000 species of bee worldwide with new ones being recognised every day. If you would like to see more of our native bees out and about then check out the native bee section at the end of this post. For all these reasons gardeners from Brisbane to Perth and everywhere in between will plant perennial pastures and bee forages. So do farmers and municipalities. The following guide is designed to teach you about some of the best Australian suited flowers that will attract and keep the Aussie bees happy in your gardens. Before diving right in, there are several essential things you should know when designing and cultivating your bee garden. Whether you’re planning a herb garden, formal garden or low-maintenance plot with herb borders follow the following tips for success, grab some plants today and get started. Strike a good balance between native and exotic plants. Native plants for their drought tolerance and attractiveness to native pollinators, and exotics for their exquisite beauty, medicinal and culinary properties. Variety is the spice of bee life. Bees like options have at least four different species flowering at any given time throughout the year (except in cold climates where this can cause problems for the bees). Exercise variety in the flowers’ shapes and length tubes. Bee-loving plants are better in groups. Plant them in clumps with one-meter diameters if you can, in layers or at least in multiple numbers to attract the most bees for your efforts. It’s OK to intersperse regular old flowers in these beds, too. Pollen makes bees thirsty, give them water. Soak the rocks, pebbles or sand at the base of the plants, but don’t drown the bees! Now that the pleasantries are out of the way, please continue reading to see some of the best Australian suited plants and flowers for happy bees. 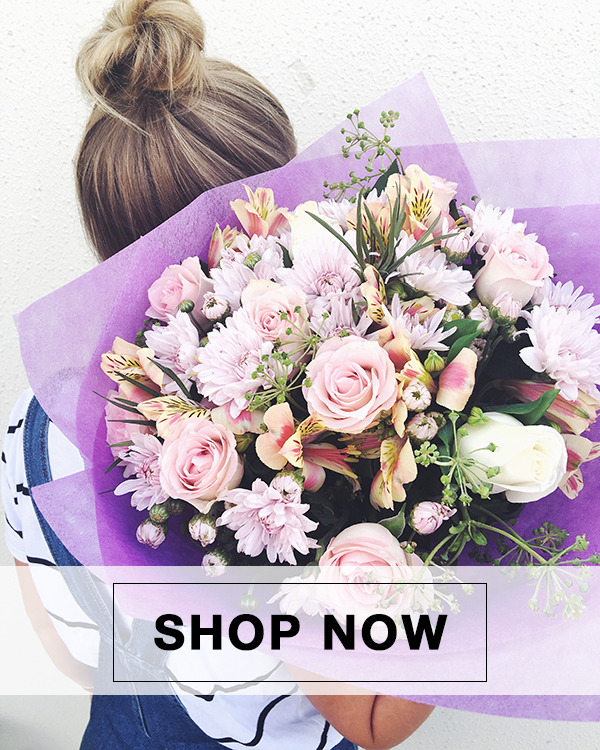 And if all this talk of flowers makes you want some yourself, we now offer flower delivery across Sydney too. The seeds of this remarkable herb were once scattered throughout Tasmania in early efforts to enhance the honeybee population and bee forages in the early 1800s. In fact, you’ll find it growing wild all over the world. 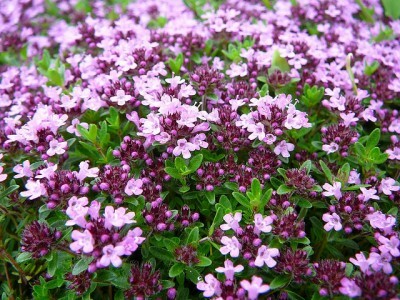 Thymus serpyllum makes for a fantastic lawn-substitute (who would’ve guessed!) and if your Thyme starts looking dead, give it a trim to rejuvenate it. ● Produces both high nectar and high pollen. ● Will grow best in cool, temperate and hot/arid climates. ● Is a must-have in any herb garden and/or as a culinary border. ● Is a perennial herb that flowers between September and February. ● Very drought tolerant, withstands foot traffic. ● Has antiseptic, antimicrobial, and antifungal properties.Plus: Ancient Greek honey was renowned for its exceptional honey that is produced from the thyme that grows wild throughout the countryside.New Zealand thyme honey is another especially delectable honey produced from wild thyme that’s escaped from gardens one way or another. New Zealand thyme honey is a light golden amber, is both distinctly sweet and acidic and doesn’t crystallise. and plenty of air circulation. ● Thyme can also be susceptible to fungus. This borderline invasive herb is widely cultivated mainly for its essential oil and honey. No matter if you’re growing it in an urban setting or domestically, put it in a pot to keep it from taking over. If grown in large quantities or as a field crop, irrigation will be required. ● Grows best in cold, temperate, warm/humid, and hot/arid climates. Anywhere. ● Flowering between December and February. ● Produces a fragrant honey with a distinct menthol taste and spearmint nuances. ● Produces relatively low pollen and nectar. ● Can be invasive. Did we mention extremely invasive? usually happens when it’s being used as a field crop for the production of the oil. This quickly growing, the small herb has short trailing stems, soft leaves and is a spreading groundcover that’s useful potted, as bedding display flower, or in rockeries. The Magenta Storksbill’s roots develop tubers and can be easily propagated many ways. If you’ve got clumps of Magenta Storksbill in your garden be sure to prune them hard in the winter. ● Magenta Storksbill is known to regularly attract honeybees. ● This herb is easy to cultivate and propagate. ● Moderately drought tolerant—but don’t push it! ● Flowers between November and May. ● Grows best in cold, temperate, and hot/arid climates. ● Produces low nectar and low pollen. Lavender is famously used in potpourris, French perfumes, and as an herbal remedy. Its flowers are also edible and it’s scent is as irresistible to humans as to honeybees. Lavender produces some of the world’s best high-quality pollen, which makes some of the world’s most prized honey. Lavender honey can be white to amber in colour with a strong floral aroma that’s extraordinarily intense with a persistent lavender component. If the honey is dark, it can have salty notes. Lavandula stoechas is prohibited in Victoria and being assessed in other states as a weed, best to avoid it. ● Produces both high pollen and high nectar. ● Grows best in cooler climates. ● Is a perennial herb that flowers between December and February. ● Looks beautiful in patches, fields, or as borders. ● The flowers smell amazing and taste great, too. ● Lavender requires full sun; it will not tolerate shade at all. This hardy herb is easy to grow and makes a great border. It’s broad leaves give off lemony scents when bruised and its flowers can be used in salads, lemon tea, and as a substitute for lemon peel in cooking. Melissa is the Greek word for bee, and the official name for the Lemon Balm because of honeybees’ undeniable attraction to it. ● Produces high pollen and nectar. ● Grows best in cool to temperate climates. ● Is a perennial flowering herb that flowers between December and April! ● Famous for the creation of Melissa honey. remove dead stems at once to avoid this. Perennial herb to low shrub. Oregano is an easy-to-grow, aromatic herb whose pungency is directly related to the amount of sunlight the plant gets. It is well-known in its wild form as marjoram, and in other forms as dried and fresh oregano. 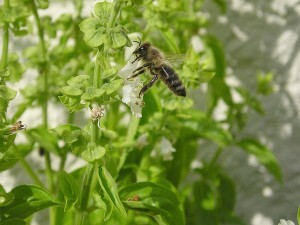 While it produces large amounts of nectar, it is hard to grow enough of the actual herb to make a honey strictly of oregano. 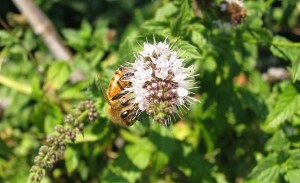 Most oregano honeys are a mix. 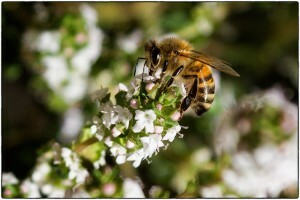 The most famous honey in Cyprus is made from wild oregano that grows on the mountainsides. ● Perennial with a long flowering period, between November and March. ● An excellent herb for culinary purposes and aromatic purposes. ● Does not produce an awful lot of pollen. 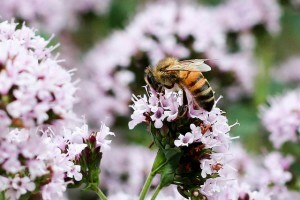 ● In order to make honey from oregano, an extreme amount needs to be cultivated. Peppermint is another bell-loving herb that produces a beautiful, musky, buttery honey in places where it is grown as a crop for its essential oil. Otherwise, its fresh leaves and flowers can be infused in teas, dried, or as an herbal medicine that packs a menthol punch. ● Produces high amounts of both nectar and pollen. ● Perennial with a flowering period between December and March. ● Grown mostly for its essential oil. bottomless container in the ground. ● Peppermint can spread, so be sure to take precautions to keep it contained. This domesticated cousin of Oregano is another excellent culinary herb that’s a bit sweeter and more spicy tasting than Oregano. Marjoram is also used in herbal medicine. The flowers grow in clusters around the stem and look like little cotton balls. 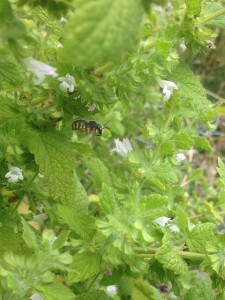 Sweet marjoram produces a minty-tasting honey that’s quite excellent. ● Produces relatively high nectar. ● Perennial low shrub that flowers between February and April. ● Used widely in culinary and medicinal arts. ● Marjoram may be easy-to-grow, but she’s a slow grower. ● Marjoram tends to have a sprawling habit. Keep an eye on it so it doesn’t take over. Sage is an extremely attractive, extremely fragrant perennial. It’s soft greyish blue leaves and spikes of lavender-blue flowers combine perfectly with roses and lavender plants along borders or in gardens. Sage has been used traditionally as a dried herbal medicine and in cooking. 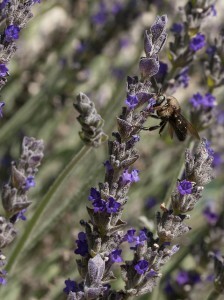 Bees are incredibly attracted to sage, they love it. ● Grows well in all climates; cool, temperate, warm/humid and hot/arid. ● Sage grows well in containers. ● A perennial herb that flowers between October and December. ● Easy-to-grow, fast-growing and hardy. ● Not good if you have an allergy to bees. Bees love this plant. ● Must first be established for about one year before it becomes drought tolerant. Borage is a beautiful, fast-growing herb that makes up for its short lifespan with heavy flower, nectar, and pollen production. Flowering just 6 weeks after germination, you’ll see fields of this plant with its loose clusters of star-shaped flower in areas that have enough moisture. Bees love this flower and its honey bears a delicate, cucumber flavour. 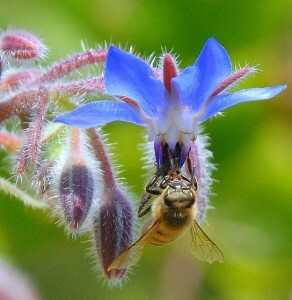 Not to be confused with blue borage honey from New Zealand. Is one of the only herbs that can grow in semi-shade. ● Produces high nectar and pollen. ● Grows best in cool, temperate, and hot/arid climates. ● Flowers between October and February, not bad for an annual. ● Requires adequate amounts of moisture to grow. This herbaceous shrub is actually an evergreen with origins in the Mediterranean. It’s most frequently used as a culinary herb. Winter savoury produces an amber-to-light green coloured honey with a medium intensity, floral notes and what can only be described as a “wet earth” taste. ● Perennial shrub that flowers between December and February. ● An excellent herb for culinary uses. ● Can be used as ground cover as it handles harsh exposure and conditions well. ● Does not produce a lot of pollen. ● It’s honey has been likened to bitter coffee taste. 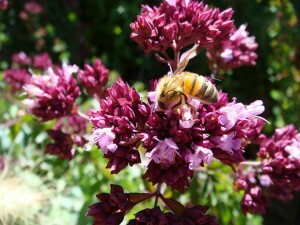 Another honeybee favourite due to its bright colours and high nectar yield. The plant itself is extremely versatile, making a beautiful cut flower or exceptional bedding and potted plant. The plant is used as a food in Africa, India and Indonesia where its young stems and leaves are eaten as vegetables. ● Produces high amounts of nectar. ● Grows best in warm/humid to hot/arid climates. ● Provides that unique shape and texture that happy honeybees crave. ● Has a pleasant, mild flavour. ● Can be used as a vegetable or side. ● Each flower head’s made up of hundreds of tiny flowers, more flowers = happy bees. ● Is an annual, so would need to be replanted. ● Flowers for just three months, December through February. Coriander is a fast-grower whose leaves can begin to be harvested just 4 weeks after sowing. It produces many small white to pinkish flowers and is a pungent herb used worldwide in salads, curries, and in other Australian, Asian, and Indian foods. ● Grows best in cool, temperate, warm/humid and hot/arid climates; basically anywhere. ● Flowers between December and March. ● Makes up for it’s annual features with a quick growth rate. ● Isn’t a big pollen producer. ● This herb is an annual, it would need to be replanted each year. Sweet Basil is an excellent complement to any herb garden. It grows up to 75cm. tall and can bush out, sometimes up to 60cm. in diameter. Sweet Basil is a well-loved culinary plant whose leaves can be added to food dry or fresh. A good gardening practice is to let some stems flower (for the honeybees) and make other stems continue leaf production (for cooking). ● Is a hardy plant, some basil will grow anywhere. ● Grows best in cool, temperate, and warm/humid climates. ● Easy to propagate by collecting the seeds. ● Produces low amounts of nectar and pollen. ● Will go to seed if the flower heads aren’t regularly plucked. ● The seeds can spread too quickly throughout a garden. Nemesia is a bit of an odd-duck, classified as an annual and a perennial. This flower blooms all year round, but mostly in the winter. Bees love them so be sure to plant a few mounds in your garden for pops of colour and happy honeybees. ● Flowers all year round! ● Grows best in cool, temperate, hot/arid and warm/humid climates. ● Bees love clumps and borders of these compact, free-flowering beauties. ● Both annual and perennial. ● Flowers abundantly in the winter. This hardy hibiscus makes a great addition to any amateur or experienced bee gardener’s collection. Prune it after the spring flowering season. ● Produces relatively high amounts of pollen. ● Grows best in cold, temperate, warm/humid and hot/arid climates. ● Has a fast growth rate. ● Native hibiscus flowers only last for 1-3 days. ● If not protected from wind, it will get straggly due to wind sensitivity. This striking shrub/small tree is well known in indigenous environments and gardens alike. 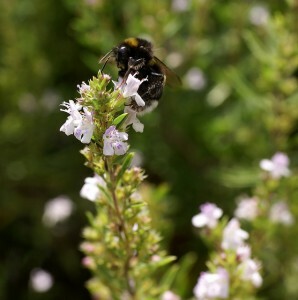 Gardeners love it for its large, cream coloured flowers and honeybees love it for its pollen and nectar. Though the tree is sensitive to fire, it is also the first to help re-vegetate fire-stricken areas. ● Very attractive to bees. ● Large, beautiful flower spikes that are commercially cut. ● Useful for sand & erosion control during revegetation. ● Rapidly grows from seed after bush fires. ● Is extremely susceptible to root-rot fungus. ● Is extremely fire sensitive. This proud shrub/small tree the Elegant Wattle (also nicknamed the Bardi bush) works well as a hedge or domestic screen, or as a windbreak along your garden. It is also the single most important modern commercial “bush tucker” plant. 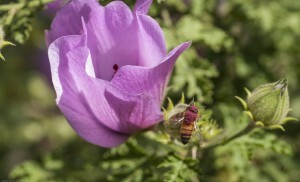 It is highly productive and its pollen production does not appear to depend on rainfall. ● Grows best in warm/humid and hot/arid climates. ● Flowers between August and December. ● Is the National Flower of Australia. ● Is the most important modern bush tucker plant. ● Flowers can be a bit prickly. Mallee to a small tree. 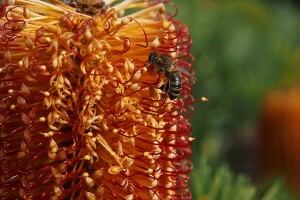 The Green Mallee is one of the major honey producers across its natural range, producing a major crop every 2 to 4 years. The honey it produces can be described as warm with a butterscotch flavour. Flowering happens for the Green Mallee tree at the hottest time of the year, so be sure to provide plenty of shade and water for proper honeybee management and cultivation. ● Grows best in temperate and hot/arid climates. ● Flowers twice! Between October and March, and June and August. ● The roots of this tree are valuable as firewood because they burn slowly. ● This tree is great for attracting birds and honeybees. An unusual, hardy little desert plant that produces bulbous, rounded fruits and curious-looking elongated flowers. 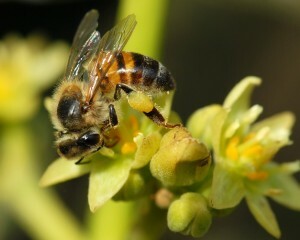 The flowers are of unique shape, thus attracting honeybees for their variety, and they provide useful quantities of both pollen and nectar through the winter and summer seasons. ● An attractive addition to any garden or yard. ● Grows best in desert temperatures. ● Has a relatively high flowering period (between November and February). Shrub to a small tree. The Guava tree is extensively planted throughout the world because of its attractiveness, tasty and nutritious fruit, and beautiful flowers. Its used on plantations as a commercial crop. Not to mention the guava is a favourite of Aussie honeybees. 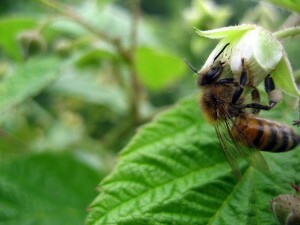 It grows quickly and produces a thin, pleasant tasting honey. ● Flowers all year round in tropical climates. 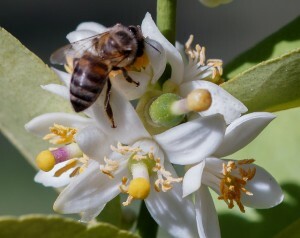 ● Produces a delicious, nutritious fruit in addition to flowers that bees love. ● Grows best in temperate and warm/humid climates. sure how to best feed your Guava shrub/tree. ● Guava is also susceptible to a fungus called Guava rust. Also known as the Queensland nut, bush nut, nut oak and bopple nut, the Macadamia tree is an attractive evergreen with holly-like spiked leaves and clusters of flower-spikes that yield a lot of nectar. 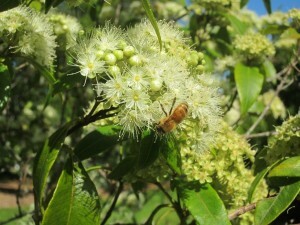 The Macadamia is productive as both a garden specimen as well as a plantation crop, and adds good variety to any bee forage. 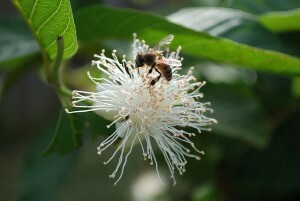 If you’re planting a Macadamia shrub be sure to plant a good-quality pollen source for honeybees nearby, too; they only visit Macadamias for their nectar. 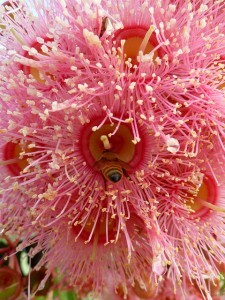 ● Produces high nectar and high pollen—plus Macadamia nuts! ● Grows best in warm to warm/humid climates. ● Flowers between July and October. ● The Macadamia nut is considered the perfect nut due to its fat-to-protein ratio. This fruit tree is used for fruit as well as ornamental uses in gardens and throughout. The fruit it produces is starfruit, and it’s really tasty. We aren’t the only ones to love this tree, though. It was found that honeybees actively search out Carambola for its nectar. With hundreds of trumpet-like flower clusters, there’s plenty Carambola for everyone. ● Flowers all year round. ● Grows best in warm/humid climates. ● Would make an excellent companion planting to the Macadamia. ● It prefers deep, well-drained loam that can be hard to insure. Did you know that bees love banana plants just as much as we do? Well, they do! Banana trees are a one-stop shop, providing high levels of both pollen and nectar. Not to mention their tasty oblong, yellow fruit. The depth at which you plant your banana plant depends on whether you’re planting it for commercial purposes or not. The banana is a fast grower, reaching the flower stage relatively quickly. 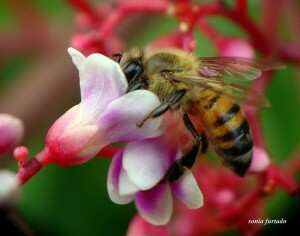 ● Is a high producer of pollen and nectar. ● Grows well in temperate and warm/humid climates. banana trees in the area. probably will, too. That’s why worldwide cultivation can be so challenging. The flowers of the Grevillea look like red spiders, the leaves like that of the holly. 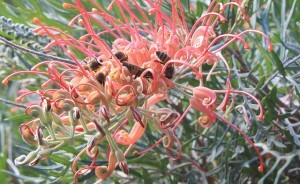 The Grevillea is considered valuable as a honeybee plant because it produces such significant amounts of nectar and pollen over a long period of time. ● Produces high amounts of pollen. ● Flowers between October and March. ● Makes a great permanent ground cover. ● Produces low amounts of nectar. ● In its natural environment, Grevillea is vulnerable to the elements. Currants come in black and red, with the flowers producing small tart berries of the same colours. Black currants are grown commercially for their jams, jellies and juice. 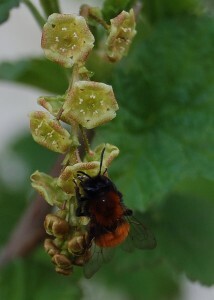 Red currants are slightly less flavourful than their black cousins, but bees love either one. Both versions of currants produce surpluses of honey and pollen. ● Is a perennial shrub that grows well in cool climates. ● Flowers between September and November. ● Unless grown commercially, produces low amounts of pollen. ● Keep the soil moist during fruiting if you want the fruit to develop properly. Raspberry s a fast-growing cane that doesn’t require staking; perfect for newbies to cane plants. The flowers open in small clusters that turn deep red when ripe. Since the raspberry plant is easily propagated by shoots, it’s necessary to keep an eye on it so it doesn’t become invasive. Be sure to buy certified disease-free canes! ● Produces high pollen and nectar! Double-whammy. ● Flowers between September and January, not too shabby. ● Good for bees, great for fruit lovers because of the raspberries! ● Is prone to disease that will spread. Thus the “certified disease-free” classification. ● The plant only fruits for three weeks. This shrub is a fast grower and stands tall, up to 4m. The bell-shaped flowers are white or pink and produce a false berry fruit when ripe. Berry bushes are an attractive addition to any garden and produce up to 7kg of fruit per bush! 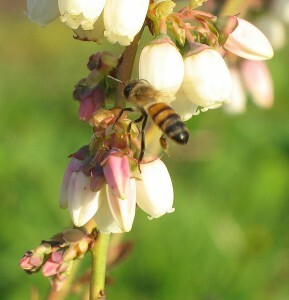 Blueberry honey is considered a delicacy and has a delicate aftertaste with hints of lemon and fruit. ● Is a deciduous shrub, pretty hardy. ● Flowers between November and March. ● Does not do well in the shade. Requires full sun. One look at these starburst-shaped flowers, and it’s easy to understand why honeybees love the Gungurru. When the flowers are in full bloom, they hang heavy and produce urn-shaped mealy-white fruits. Quite the attractive floral package! Works well as a low shelter or simply another garden or streetscape feature. ● Yields high amounts of honey. ● Has an elegant look. ● Responds well to hard pruning. ● Produces high nectar and pollen! ● Flowers between June and August. ● Juveniles need to be protected from the wind and frost. ● Has a relatively short flowering period; June through August. Possibly the most unique-looking plant that honeybees can’t get enough of. 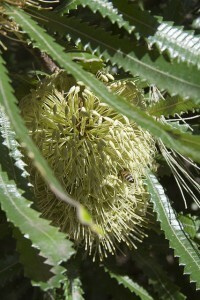 The Hairpin Banksia looks like an oversized honeycomb or hairpin that attracts bees and birds alike. The species is highly adaptable and makes a great windbreaker component to any landscape. This plant is highly attractive to bees and helps them make it through the winter by providing nectar. ● Compact shrub that works well alone or as a border planting. ● Flowers between April and August, not bad. ● Grows in cool, temperate, and warm/humid climates alike. Large shrub to small tree. This beauty looks like it belongs in the tropics, or under the sea amidst a bed of sea anemones but it’s actually native to Australia. The Pincushion Hakea is striking when an adult but requires staking and protection from wind and frost when it’s young. ● Is known to be very attractive to honeybees around the world. 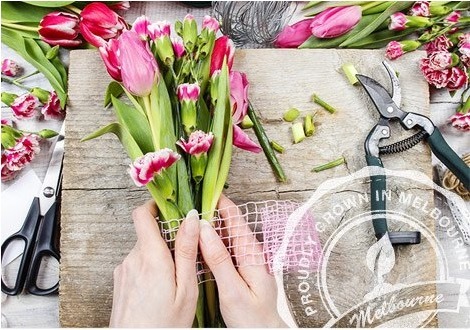 ● Makes beautiful cut flowers. 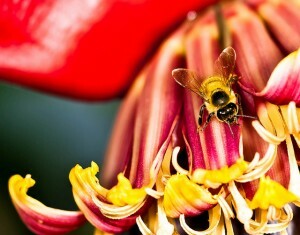 ● Is a producer of both nectar and pollen. ● Also attracts a variety of bird. ● Requires protection from frost and the wind while becoming established. ● Is susceptible to root rot fungus. ● Needs full sun; shade will simply not do. The Passionfruit grows well in nearly every climate and makes an elegant addition to gardens or landscapes. It produces a juicy, sweet fruit that tastes like guava, and a flower that looks something like an alien. If you want to grow Passionfruit, be sure to get a stake or trellis to support it as it grows and climbs. ● Produces high amounts of pollen and nectar. ● Climbing, woody perennial that gives an effortless, exotic look. ● Flowers twice per year! Between February and April, and July and November. 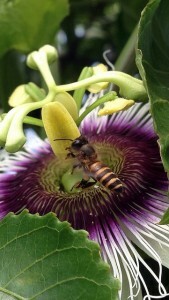 ● A bit high-maintenance; Passion flowers are sensitive to poor soil. ● Yellow Passionfruit are more resistant to nematodes than Purple Passionfruit. 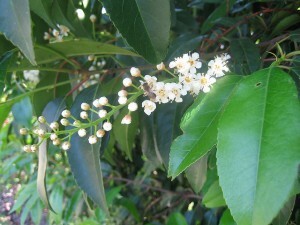 The flowers of the Portugal laurel resemble Lily of the Valley but don’t smell nearly as sweet. One of the best-recognised evergreen ornamentals this side of Tasmania, the Portugal laurel produces a brilliantly deep purple fruit—but don’t try to eat it, it’s inedible. Mainly used as a hedge or screen, the Portugal laurel provides enough pollen and nectar to support an entire bee colony, so a must for any bee forage. ● Grows best in temperate to cool climates. ● A large evergreen shrub that’s beautiful as landcover, borders, or stand-alone. ● Can be grown into a bush or shaped as a topiary. ● Ironically enough, the Portugal laurel is susceptible to honey fungus. ● Also susceptible to Silver Leaf disease. This super-attractive small citrus tree is awesome because it produces up to 3 crops of fruit each year, and is covered in flowers and fruit 90% of the time. Lemon honey is a very light colour and has a sweet, slightly acidic taste. Depending on the region in which you grow your Lemon tree, you’ll grow a “Eureka”, “Meyer”, or “Lisbon” variety. ● Produces high amounts of nectar, pollen, and fruit (3 times per year!). ● Honeybees love this tree, and it flowers almost all year round. ● Produces a delightful honey with a weak floral aroma. ● Is sensitive to frost. ● Needs to be kept watered. The Apple Tree is a necessity of any urban bee forage or pollen bank. Whether dwarf, potted, balcony or larger, the Apple tree is a valuable and significant orchard tree. The Apple tree will need to be cross-pollinated to successfully fruit, but honeybees don’t care about the fruit. 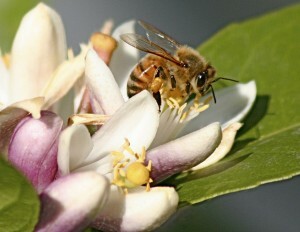 All they know is that Apple trees produce enough pollen and nectar to support a whole hive. Unfortunately, Apple trees have a short flowering season. ● Produces high amounts of pollen; enough to support a hive. ● Grows best in cool, temperate and hot/arid climates. ● Come on now, this tree produces apples! ● Only flowers between September and October. 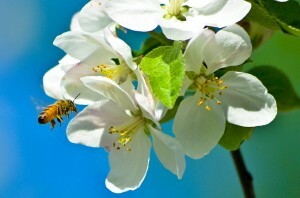 ● Cross-pollination is required to fruit (cross-pollinate with the Crab apple). This small-but-attractive tree grows fast and produces large, spidery flowers that can range in colour from bright red to cream. The tree is hardy and adaptable to many environments and uses. It’s a triple threat that withstands fog, drought and smog. 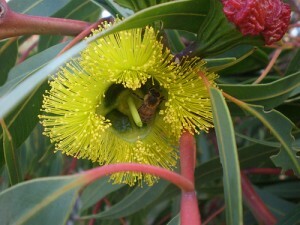 Why do bees love the large fruited yellow gum? Because it produces a tonne of nectar! ● Is easy-to-grow and hardy. ● Is a beautiful, striking tree. ● It is pollen-deficient, to say the least. ● It is a small tree. Must have if planting bee forages, trying to attract or aid honeybees. 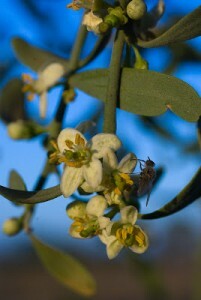 This fast-growing Mallee has dominating red buds with lime-yellow flowers. Tufts of bright yellow stamens become prevalent during flowering, and the showy buds make a full landing pad for honeybees. The species is so drought tolerant that it’s being used in Israel for desert rehabilitation and the provision of extensive bee forages! ● Grows the best in warm/humid and temperate climates. ● Flowers between March and June. ● Has large flowers suitable for honeybees of all sizes. ● Is officially recognised as being beneficial to honeybees and as a honey producer. ● Responds well to pruning. ● The gum fruit can be heavy and cause the trees to spread and break in storms. Alright, first things first: Hickson is the name of a cultivator in Roma. Now that we’ve gotten that out of the way, this versatile plant comes in sizes ranging from large shrub to small mallee and tree. 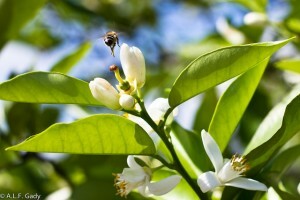 Your typical citrus tree, it grows at an average pace, with slender, thorny branches and waxy white flowers. These make excellent home garden trees, they’re compact, decorative, and produce a lot of fruit, too. ● Produces significant volumes of both pollen and nectar. ● Amino acid content of this tree’s honey is well above the standard amount. ● Cannot be waterlogged. Repeat: intolerant of water-logging. ● Require a lot of fertilisation. Be sure to keep an eye on this. a complementary species to make up for this. There is an abundance of Plum varieties available to Australian gardeners, but a crowd favourite is the “Angelina” for its prolific fruit bearing. 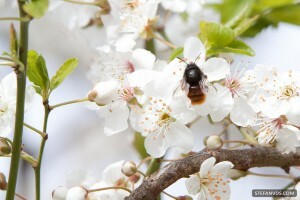 Plums are an excellent addition to gardens or bee forages because they can be grown large or kept compact. 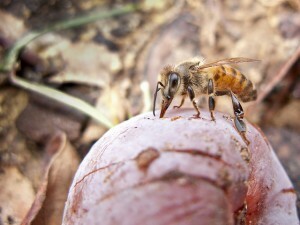 However, cross-pollination will affect the size of the fruit and is necessary to maintain a hive. 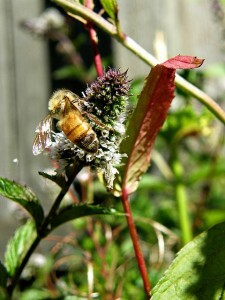 Consult your local garden to find out what the best cross-pollinator is available near you. ● Produces relatively high pollen. ● Flowers between August and September. same time, that distracts bees. ● Plums need bees. Plums cannot be planted alone. The persimmon is taken for granted in Australia because of the older astringent varieties that abound, but the non-astringent varieties are also extremely attractive to honeybees. The persimmon produces a water-white honey with a crisp taste. ● Produces high amounts of honey. ● Has a moderate growth rate. ● Displays brilliant pops of autumn colours. ● Has a spreading habit, which can be a problem in some environments. Tall shrub to small tree. The Lemon Scented Myrtle has a long flowering period, between December and March, and despite producing not that much nectar and pollen makes an excellent garden specimen. The Lemon Scented Myrtle is also a good food and essential oil source. The flowers are profuse and hairy-looking, attracting honeybees from far and wide. It’s great to add to tea because—due to its lack of acid—won’t curdle your milk. ● Is easy-to-propagate with just a few cuttings. ● Can grow tall or be kept as a small shrub. ● When not flowering, the waxy leaves still give off a strong lemon fragrance. ● Not a very abundant producer of nectar or pollen. ● Is susceptible to fungal rust on the leaves. The Lime Tree is a great little citrus tree whose flowers look even better up close. An attractive plant with dense foliage, the lime tree will flower multiple times in warmer climates and produce fruit all year long. Some varieties have thorn’s, for a thornless variety opt for the Tahitian lime, it also has a better, broader climate tolerance. The Lime is a must-have for any tropical garden, but it can be grown in cooler climes, too, just watch out for frost! ● Grows well everywhere; best in cold, temperate, or warm/humid climates, though. ● Is a high fruit producer and will make its environment smell sweet and citrus-ey. ● Is very susceptible to frost, take care to protect it in cooler climates. If you’re lucky enough to grow successfully an Avocado tree in your garden, by all means do! Avocadoes are another bee forage must-have and come in compact, self-fertile, and large varieties. If you’re in it for the fruit, be sure to cross-pollinate for the best results. Avocado honey is distinctly thick, dark, and has buttery and molasses undertones. Avocados are commercially valuable and widely cultivated. They grow pretty quickly, and bees love ‘em. ● Produces high nectar, high pollen, and avocados! ● Grows equally well in temperate and warm/humid climates. 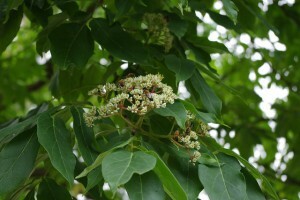 ● Is a profusely flowering tree. ● Come in a variety of sizes. ● Only flowers between September and November. ● Need full sun and well-drained soil. This attractive spreader will grow quickly at first, and produces a gorgeous floral show ever mid-summer that turns into red fruit with small, shiny black seeds. The masses of flattened clustered flowers are quite fragrant. Overall an under-utilised tree! Only the Chinese have the right idea, where the Bee Bee Tree is highly-sought due to its high honey production and the honey’s mild, syrupy aftertaste. ● This tree produces nectar like a champ. ● Grows well everywhere: cold, temperate, warm/humid and hot/arid climates. ● Can be used on a farm as a nectar source. ● Well-suited for gardens, parks, and urban settings. ● Only flowers between December and February. The Red Mallee is an attractive garden specimen that produces prolific clusters of buds and flowers. An extremely useful tree, its leaves have a high oil content that can be used for oil or as biofuel, and its bark is a traditional firewood because it burns so slowly. 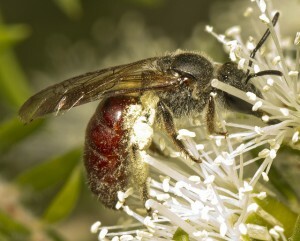 Bees love the Red Mallee because it’s a faithful producer of average-quality pollen. ● Drought tolerant and tolerant to saline and alkaline conditions. ● Produces relatively low amounts of pollen. Gracefully whimsical and reminiscent of the Mimosa tree, the Coral Gum produces both honey and gum nectar profusely and is known for having a good pollen supply, too. 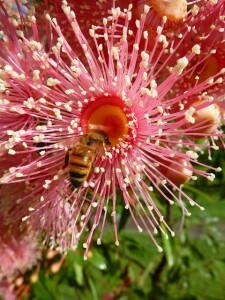 Needless to say, the Coral Gum would make an excellent addition to any serious bee forage. 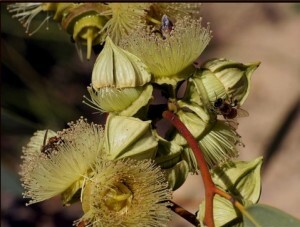 The Coral Gum is a spreader and can require a two-year investment before any flowering is seen. ● Produces high amounts of nectar and pollen. ● Drought tolerant; actually grows in dry summers. ● Super short flowering period; between August and September. ● Takes up to two years before producing coral pink, white or cream flowers. Medium shrub to small tree. Not to be confused with the ordinary Lime tree, the Desert Lime is the quickest citrus tree to begin fruiting after flowering. So if you have little patience for fruit, this could be the citrus tree for you. Another bush tucker that no good bee forage should be without. The fruit of the Desert Lime can be substituted for regular lemons or limes in any recipe or use and are, in fact, quite nutritious. It’s also frost hardy and drought tolerant to boot! ● High producer of nectar and pollen. ● Works equally well in warm/humid and hot/arid climates. ● Flowers between September and October, not that long. This cute little tree, also called the Rottnest Island tea-tree and the Moonah, is made up of densely packed bottlebrush flower spikes that range in colour from white to pinkish. The Dryland Tea Tree is very hardy and can do well in a variety of climates but is mostly used as an ornamental planting. It’s maintenance-free and works well as a windbreak. True story: the Dryland Tea Tree’s honey used to be considered as a pollutant of better honeys, nowadays it’s highly sought! What more would you want in your bee forage? ● Makes a great-tasting honey. ● Flowers between October and July. ● Is super-easy to grow! Unfortunately trying to find photos of native Australian bees on the ideal flowers was tricky so you may have noticed that the majority of bees in the above photos were actually from all around the world. The most common honey bee in the photos is the European or western honey bee (Apis mellifera), don’t be too hard on them though, its Australia…most of us were introduced here too. Note: A few of the images contain the Bumble bee (Bombus terrestris) which is considered an invasive pest in Australia and is illegal to import!. The Bumble Bee has made itself at home in Tasmania and studies have showed negative impacts on our native flora and fauna. 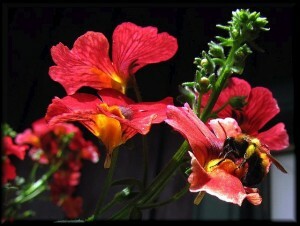 However, the focus of the article was more about the flowers than the bee species, and we preferred to see an image of a bee on our flowers than just the flower! But to be fair to our cute little friends we decided to add some of our favourite natives below. Using a variety of flower shapes is key as the native bee species have a high diversity of tongue lengths to suit different flowers. Below we have listed only a few of the favourite flowers for native bees, like all pollinators they will visit almost any flower that contains nectar and pollen. Adding hollow sticks, a source of water, drilling holes in old logs/timber and building your own bee hotels may help attract a few native bees. 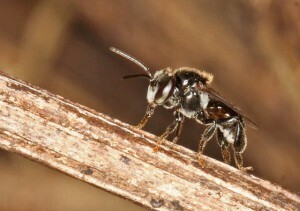 The Stingless bee is generally found between NSW and Qld preferring the warmer temperatures. They are one of the few species of native bees that form large social nests or hives. The bees grow to between 3-5mm , flight range is approx. 500m and they are an excellent bee for enthusiasts to keep in back yard hives to produce delicious sugarbag honey but only in warm climates and the bees only produce around 1kg per year. The Blue-Banded Bees are a solitary bee and have the ability to buzz pollinate flowers that typically rely on other means of pollination. Buzz pollination is a technique where the bee causes vibrations to the flower which releases the pollen. The Blue-banded Bee can be found throughout Australia except for Tasmania (you have the bumble bee, though), grows to 10-12mm and appears to prefer the nectar from blue flowers.. 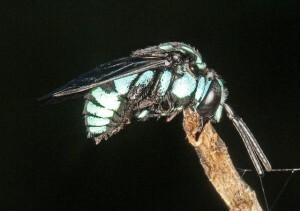 The Cuckoo Bee are very beautiful but they have a dark side… The cloak and dagger Cuckoo bee is a solitary parasitic species which seeks out and lay eggs in other bees nests like the blue banded bee before they are completed, the cuckoo bees larvae hatch first and eat most the provisions stored inside often leaving the legitimate larvae to starve or be eaten too. No bees where harmed in the photo this is how they sleep, locking their mandibles onto a twig. other bees such as the teddy bear bee and blue banded bees also do this. The Teddy bear bee is possibly the cutest of our bees and another native bee that can buzz pollinate (sonication) which is ideal for tomato plants that rely on vibration to pollinate. 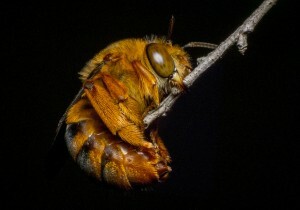 Teddy bear bees grow to around 7 to 15mm and can be found in most states except for Tasmania, they have a relative called Amegilla dawsoni who can grow up to 20mm. Since we are comparing sizes, the biggest Aussie native bee is the Great Carpenter bee (Xylocopa) growing up to 24mm and also able to buzz pollinators. The Reed Bees get their names from the way they nest inside old pith centred stems like raspberries, reeds and the Lantana. 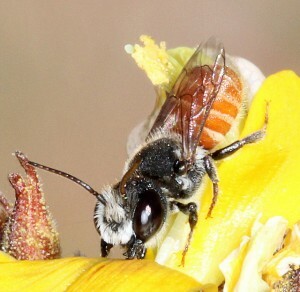 They are classed as a social bee due to cooperative behaviours within their species and grow to between 5-8mm. 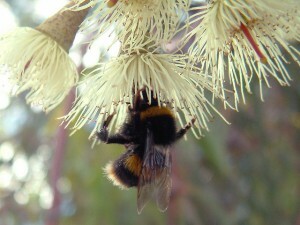 Reed bees can be found throughout Australia….even you Tasmania! 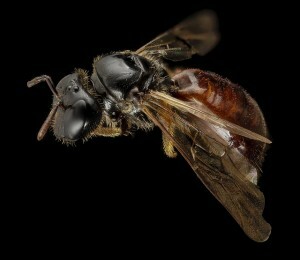 The masked bee can be found throughout Australia and grow around 3mm to 11mm. 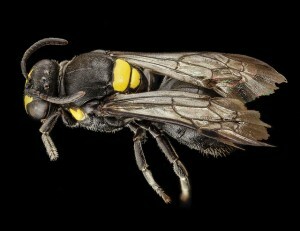 The female Hylaeus bicolorellus uses her jaws to tear flower buds open and steal the pollen. They transport pollen and nectar to their typical solitary nest internally in a “honey stomach” or “crop” rather than externally as they are similar to wasps, they have an absence of scopa and pollen baskets. The bee lacks strong mandibles and other adaptations for digging so prefers to use pre-formed cavities or burrows made by other insects. The Leafcutter bee can be found all around the world and most species will cut very neat semi-circle segments from leaves and use them to make the cells in their nests. After being introduced to American alfalfa farmers as pollinators they noticed their alfalfa seed yields increased dramatically. Size range is 5 – 14mm and they often nest in holes in plant stems, dead wood, cliffs, old walls even old garden gloves left outside. Butterfly bush (buddleja sp. 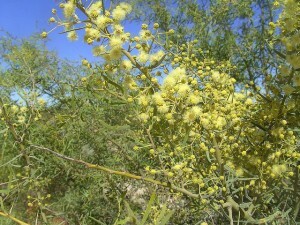 )-Leaves and flowers **use hybrids “Spring Promise” or”Wattle Bird” as they are non-invasive. Don’t forget to check out our Flowers instead of pesticides article to improve your gardens ecosystem. Aussie Bees love native plants, so please check out Australian Plants Society ( your state ) for some excellent native plant information! We have taken care to try and avoid listing plants classed as weeds by following the national weed list. Thank you for reading and happy planting!! A special thanks to all the wonderful people who gave us permission to use their photos in this article and to all of the people who have given us some great feedback and information. Thanks Greg, we are glad our article can assist you and your bees. Have fun with the planting and enjoy all the flowers and happy pollinators that will arrive. Thanks Jess, glad you liked our post. We would love to know if you’re implementing any of these ideas and what results you get. thanks – really appreciated – I have just started my first hive and I found your wisdom and information brilliantly helpful. Thank you for you kind words Nick, a lot of research and time went into this post and I am so glad we could help so many people. I wish you all the best with your first hive, and we would love to know how it works out. Thanks I have been using this a lot for buying plants to save the bees! Fantastic!! Thanks Julie, you should try making the bee hotels too if you have a good source of flowers. Does not appear to be a website or any information on Bee Hotels in Ballarat. I have a couple of very helpful links if you want to perhaps look at building your own? Love this! We should talk more about these kind of bee and plant things. excluding a small fun garden and veggie patch we have an australian plant garden. not a blade of grass! smaller plants the bees love (we have a native bee hive) are brachyscome, paper daisies and native jute (corchorus cunninghamii) and you cannot go past alyssums. Thanks for the great advice on plants for our bees! You sound like your little ecosystem is thriving, keep up the great work! What a fantastic post! My nursery shopping list just got bigger! Oh and If you really want to make a blue banded bee happy, I recommend planting Agastache also known as Hyssop or hummingbird mint. I have two species growing in my garden, rugosa and aurantiaca (apricot sprite). Agastache has a delicious licorice scent which smells lovely after it rains, a long flowering season and many culinary uses. Since planting Agastache beside my eggplants and tomatoes I have had increased produce which is likely due to the blue banded bees buzz pollination technique. Thank you for the kind words. After researching this article, I went out and bought all of the seeds that I could find on the list and planted them. 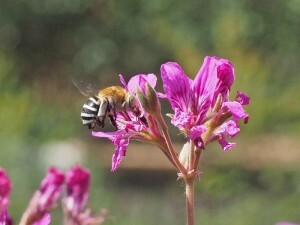 My gardens are now buzzing with bees, mostly the Europeans but I have had blue banded and the small Reed Bees too. Thanks for the great tip on the Agastache, I will be searching for these seeds on my next trip to the seed shop. Thank you so much for the effort you have placed on this article! I was surprised to find a honey bee visit our third story balcony and take on porticula grandiflora flowers instead of our many herbs and other flowers. I believe the native reed bee tried to build a nest inside a hole of our portable clothes line, so I’ve been trying to find a decent article on native bees since. This is great information. Thank you! Have you looked at building a bee hotel for the bees? A terracotta plant pot on its side packed full of hollow cane or bamboo (different sized) looks good and works too. Or type ‘bee hotel’ into Google image search, there are some very fancy hotels! I would love to know if you decide to build a bee hotel and if you score some guests. This is a great article. I’ve been googling for days for this information and here it is!! I hope that our article answered all of your questions. Let us know if you need further information. Great article. Thanks for this as we are working to attract more bees and birds to our property. Enjoy watching your garden transform into a hive of activity! This is what i have been looking for for weeks. Thank you very much for all the time and effort put into this research. Am in West Africa, and i hope these flowers will do well here. I have ordered for some seeds from aliex. Keeping my fingers crossed. May need some information later on how to properly plant them especially the best time to plant them. Thanks Irabor, we wish you the very best with the planting 🙂 Hopefully the seeds come with the ideal planting times and extra instructions. 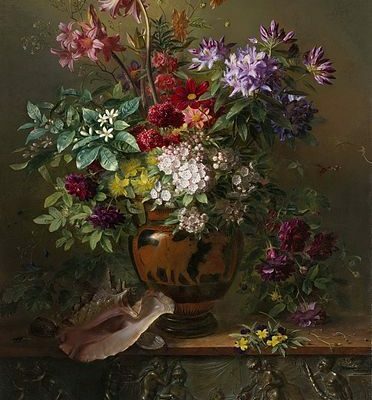 Agapanthus, gazania, aloes, cape violets, cape honeysuckle, asparagus fern, ribbon bush, bush willows, butterfly bush, clivia, weeping wattle euryops daisy, felicia, carpet geranium, lion’s ear, osteospermum, tree fuchsia, sweet thorn karee, and vygies. Good luck and please let us know how you go! Thank you very much for your reply. My seeds are just coming in, i have received thyme, lavender and celosia cristata (cockscomb). Hopefully it would grow. But it seems i need so much hectares of land to do commercial bee keeping for honey. Great news on the seeds arriving 🙂 Unfortunately we cannot help you in regards to starting a honey bee hive or how many hectares of land with flowering plants you need but if you check out http://www.bernard-preston.com/HOW-TO-START-BEEKEEPING.html and http://www.beequip.co.za/?page_id=274 they may help you more. Thanks boss, You are too much. Did you have any luck growing those seeds my friend? Great Info. Exactly what I was looking for ,concise and comprehensive list. Many thanks for your effort to provide this. Thank you Dinatarini for taking the time to comment, most appreciated. Hello Justin. I am always looking for articles on bees and have found your informative piece and hope that it is still active as I would like to thank you as the article has given me much needed information about bees. For several years I could count on one hand the number of bees in the garden, particularly the blue banded and teddy bear bees. 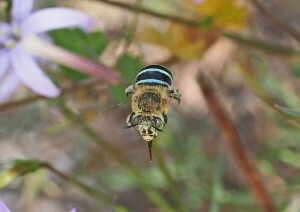 This year there has been an explosion of the blue-banded bees, there must be at least twenty of them. The teddy bear bee is still a bit of a loner as there seems to be just one or two. 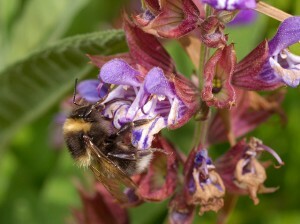 I was particularly concerned at the way in which the blue-banded bees were congregating along a twig on a salvia bush, there would be up to twelve of them lined along the twig, until I see in your article that they are merely resting or sleeping. I have a variety of plants to which they are attracted, e.g. lavender, various salvias, herbs , but one plant in particular they like is an African Blue Basil and, of course, echium. If you haven’t already then you should look at making some bee hotels for your Blue banded bees. Hello again Justin, thank you for your supportive comments. Our next project is going to be making some bee hotels. 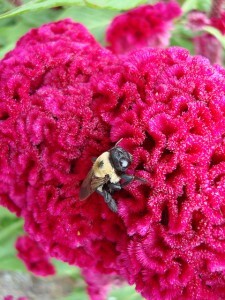 About the teddy bear bee, there seems to be only the one that we can see and even that is elusive. If you would like I can send you some cuttings of the African Blue Basil or I know that it is available from Herbcottage in Queensland and Greenpatch Organic Seeds & Plants. 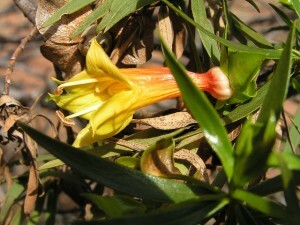 It is a sterile plant and does not grow from seeds. Justin, I meant to add that I have also seen a couple of the Neon Cuckoo Bees in the garden which I was entranced by as they are so attractive but after reading their modus operandi I have changed my opinion of them. Nature can be cruel, don’t be mad at the Neon Cuckoo Bees, they play an important role in life just like all of the other bees. It’s a good sign that you have them with all the other species in your garden! This means you have a thriving little ecosystem that is helping make a difference to the native bee populations, keep up the great work!! We must keep in mind that helping honey bees is not a conservation issue, only an agricultural and economic issue. Now, about native bees, this list is absolutely terrible. It includes a large number of non-native plants (thyme, spearmint, oregano, lavender, peppermint, sage, blueberry, raspberry, passion flower, etc.) 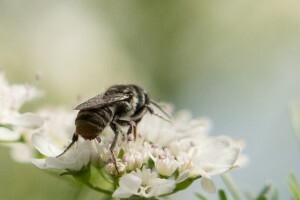 hardly beneficial to native bees. Please! How about another list of just native flowers? 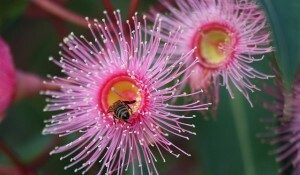 I apologise for the confusion, this post was never intended to be about Native Bees and Native plants, it is about selecting the best Australian suited flowers and plants to benefit all bees and pollinators that are currently calling Australia home, regardless of where they originally came from. There are plenty of native flowers listed further down the page and thanks for your great suggestion of another list featuring just native flower our native bees, I will let you know as soon as its complete! A fantastic and thorough resource ! Thanks so much for making it available. Happy bees means happy me ! Comments like yours really make our day!